HOLLISTON - A piece of legend still lives on. Astronaut Alan Shepard may have died last Tuesday night, but an American sycamore tree growing beside the police station is a living reminder of his life and historic space missions. "It was a big deal at that time," said Town Clerk Nancy Norris. In April 1976, the town received a 4-inch root clipping grown from seeds taken into space on Apollo 14 in 1971. This was the mission where Shepard and Edgar Mitchell made their historic walk on the moon. The third astronaut on the mission, Stuart Roosa, orbited above Shepard and Mitchell in their command module called "Kitty Hawk". Packed in small containers within Roosa's space pack were hundreds of tree seeds. It was part of a joint NASA and USFS project. Some of the seeds were planted as the control in the experiment, but most were given away in honor of the US's bicentennial celebration. Every state was supposed to receive two trees, said Everett Reed, a local historian for the town of Pembroke. Holliston was chosen as one site, and Pembroke was chosen as the second. Reed said his town's moon tree was planted at a historical society's building in North Pembroke and they had "quite a celebration" for it. Unfortunately, he said Pembroke's moon tree died about a year-and-a-half after it was planted. 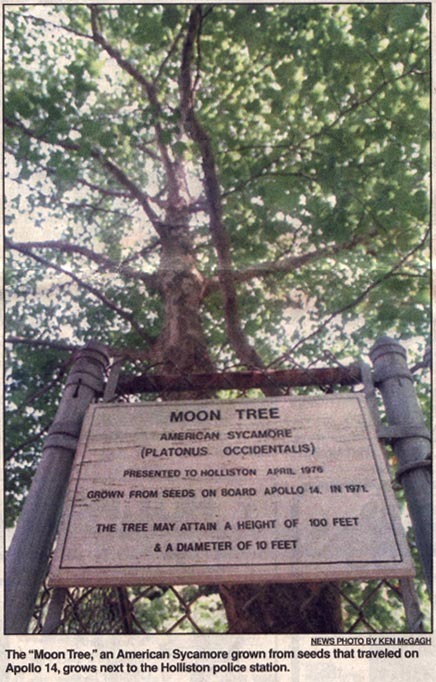 Upon hearing that Holliston's moon tree was still alive and well, Reed said he might call the town to get a clipping from the tree to grow another one in Pembroke. But even though today Holliston's moon tree stands proud and strong, things weren't so easy when the town tried to plant the tree. NASA sent a root clipping, instead of a seedling like the town expected, and after its five-day journey to arrive, the root also died. NASA quickly sent another root, but now the town couldn't plant it. Instead, a stand-in tree was planted, while the "real" one was sent to grow at Weston Nurseries in Hopkinton. Most people never knew - or forgot - that the tree was a fake until it was replanted six years later. "We went through a lot of rigmarole," Norris said about getting the moon tree. She said a lot of people attended the ceremony to plant the tree, not only because it was the town's anniversary, but also because everyone was proud to be the recipients of this special tree. The police station was chosen as the site to plant the space seeds because it was the safest place, Norris said. But according to a Middlesex News article at that time, the fake tree was stolen six days after it was planted by some unidentified teenagers. Now a small chain-link fence encloses the real one with a small plaque heralding it as the "Moon Tree". Safety Officer Norman Gillen said everyone used to come and look at the tree and ask questions when it was originally planted. He said they always used to look out the window and see people around it.